I took the tree down and allllll the decorations through the whole house. I was going to wait until the next day, but I was just motivated to do it I guess. It’s kinda irritating when I get like this in the early evening, becasue then it takes me longer to settle down and shut my brain off and then I have trouble falling asleep and then I wake up later in the morning. Argh. 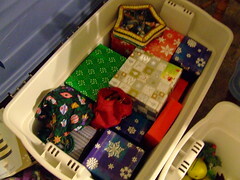 I dug out all the Christmas boxes and also resorted everything in them. I also cleaned out some of the decorations (not just ornaments) and got rid of things we wound up never using or had no sentimental value. If I hadn’t used X in the five years since I acquired it, I am not going to. I also tested all the strands of lights and tossed any that were all burnt out. I’m really picky about having it all neat and organized in a way that makes sense to me. I worked up a sweat going around the tree and even turned the stove down because I was hot. Not just to annoy the hubby later. 3am the next morning I woke up having issues breathing because either the dust or the tree or the carpet rolling or all of it clogged my lungs up. Great. So eventually after Ron growling too, I got up and sat on the couch watching tv in the wee hours. At 5am I finally went back to sleep. I had been trying to clear up my lings with Buckey’s and tea but it was only so-so. Just about when it was cleared, Ron was ready to move my stuff out of the old office into the new one. It was bad enough being in two rooms that it was even affecting my work. he made sure to go really slow and only involved me where he needed another person. I accidentally wiped off some dust though, so that sent my recovering lungs off again. 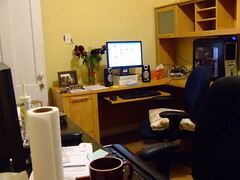 After we got my desk in the office, I finally remember that I had allergy pills. They helped and I didn’t wake up in the middle of the night with a vice on my chest. And I get to work alongside the hubby again.